I’m not really sure what those whom voted to leave are now expecting to happen or how quick they think it will happen. Are they expecting clouds to part and the sun to shine constantly, for people to have street parties full of Union Jack flags? – possibly soon to be extinct flag with Indyref II on the horizon. Are they of the belief that we’ve defeated the monster which was stopping us from progressing and improving everyone’s lives? Do they expect crime to stop or fall and us all to integrate with one another in harmony? Okay I’m being sarcastic, but what do those whom voted to leave really expect to happen now that we’ve voted to leave the EU? To consider this, I have to consider the reasons why, from their perspective, they’ll have voted to leave and what they’re now expecting to happen, so here goes: more money for the NHS; easing the housing crisis, education shortages and cost of living difficulties; more and higher paid secure full-time work; controlling immigration; sticking it to the establishment – especially the anti-democratic eurocrat establishment; taking back control; reclaiming communities from foreigners whom refuse to integrate and because it was the patriotic thing to do. Is that really what was on offer at this referendum? Only time will tell for sure. Not to sound too pessimistic, skeptical and cynical, but I don’t think we’ll see any of that, I don’t believe that was what was on offer. I’m not denying that there were many valid reasons why one would vote to leave or that those are what every single leave voter voted for, but those listed, regardless of whether you believe in them or not, they’re not what this is really about. 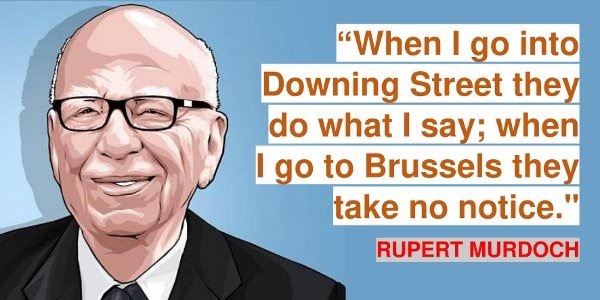 “When I go into Downing Street they do what I say; when I go to Brussels they take no notice.” Rupert Murdoch. The best evidence of what Vote Leave has always been about comes from considering the reasons the Vote Leave camp have propagated. The EU has never, or at least absolutely nowhere near that which was claimed, dictated and controlled that which we do – beyond what we had a large say in (well, apart from that our elected representatives in UKIP, our UKIP MEP’s, either not turning up or siding with the establishment anyway), beyond trade deals we’ve agreed to, beyond rights and laws we’ve played a part in creating – such as human and workers rights. Immigration hasn’t been the cause of the problems we face, government policies stretching back to Thatcher have been the cause (I have discussed more about immigration and societies problems in my previous article, which can be found here – https://politicalsift.wordpress.com/2016/06/24/i-wonder-how-it-feels-to-believe-that-immigration-is-the-cause-of-societies-problems/). The way to solve societies problems isn’t going to come from and happen now we’re leaving the EU, granted the EU is a part of the corrupt neoliberal globalised corporatist demon we need to defeat to bring about change, but the protections from the EU, debatably, helped in some way while opposing the neoliberal globalised corporatists which control the Tories, opposing and defeating those, together, is how we solve societies problems. Leaving the EU has debatably weakened our position, weakened our opposition, weakened our links to our allies for change in Europe and elsewhere. Leaving the EU is likely to be the most disastrous for the majority of the very people whom voted to leave. Akin to the general election, which saw the Tories come to power unaided this time by the Liberal Democrats, there’ll be claims that I and many others are sore losers, that we should accept a democratic decision, but, for starters, that isn’t what democracy is about, democracy is an ongoing process. Forget how the Tories ‘won’ the general election with only 20% of the public (the 20% figure is when one considers those whom could have registered to vote, but didn’t), even if the Tories, under the same circumstances, had won with 51% of the entire electorate, it still wouldn’t have been a ‘democratic’ decision. This does, obviously, depend on your definition of democracy. My personal definition of democracy doesn’t include political parties having the backing of around 85+% of the mainstream media – where most people receive their information from which to make a supposed democratic decision. My definition of a democracy doesn’t include the grotesque and abhorrent smears in the mainstream media against the main and other opposition. My definition of democracy doesn’t include political parties being funded by million/billionaires and a funding process where political parties spend more than one another, where political parties while in power quietly change the election funding process and still break the rules that do exist. My definition of a democracy doesn’t include large sections of an electorate purposefully under and inadequately educated, unequipped with the teachings on critical and analytical thinking. My definition of a democracy doesn’t include large sections of the electorate being unaware of that which they should and could be taught at school, at least some basics in things vital to our way of life – politics, economics, social issues and so on. My definition of a democracy doesn’t include large sections of the electorate being unable to understand certain terminology, alternative views and explanations and an electorate largely unaware of the manifesto of the parties they’re voting for. My definition of a democracy doesn’t include the spectrum of debate always being within the confines of plutocrats. My definition of a democracy doesn’t include political parties spinning and blatantly lying to the electorate, saying one thing while doing something entirely different, e.g. austerity. My definition of a democracy doesn’t include the scapegoating and despicable attacks on minority groups, bullying those without a mainstream voice, causing division, conflict, deflecting attention and causing untold misery and suffering to some of the *most vulnerable* (and any level of *vulnerability*) people in society. My definition of a democracy doesn’t include voter suppression, it doesn’t include first past the post (which granted we didn’t have in the EU referendum), it doesn’t include refusing to use modern technology such as the internet to increase voter turn out. My definition of a democracy doesn’t include manipulated consumerism, brainwashing advertising and created difficulties to manipulate self-esteem, psychological, mental and emotional wellbeing difficulties. My definition of a democracy doesn’t include engineered attitudes and the lack of a voice for ‘ordinary working people’. My definition of a democracy doesn’t include engineered apathy and mistrust, especially amongst the young and/or poorest. My definition of a democracy doesn’t include control and oppression. A ‘true’ democracy is impossible, we can’t all expect to know absolutely everything, we can’t all be expected to have the time to truly understand everything, we can’t expect to have an entirely unbiased media while maintaining any notion of a ‘free press’, we can’t expect a perfect party and election funding and spending process, we can’t all expect to not have cognitive bias, dissonance and similar, we can’t expect to solve or improve some or all of the problems I feel we have with our democracy at present. Regardless of whether a true democracy is possible or not, there’s simply far too much wrong with our democracy for it to be considered a democracy. I hope we can at least have a democracy where people have different views and opinions – yes absolutely of course, where debate takes place amongst all in society, but these different views and opinions have to be based on the best information possible, they have to be as genuine as possible and we have to have an electorate equipped with the tools to make democratic decisions. We have to move away from our democracy of lies, spin, propaganda, apathy, inadequate education, misinformation, misunderstanding, scapegoating and manipulation. How to change the state of our democracy is debatable and something I look forward to hearing your ideas for. Whether or not you believe we have a democracy now and whether you disagree with my opinion is something I also look forward to. Whether or not you believe leaving the EU will ultimately be for the best and your thoughts on everything which I’ve written is something I look forward to. I try to be as open minded as possible and always look to start discussions, rather than try to definitively end them, I respect and appreciate that I may be wrong and welcome friendly debate. The EU referendum result hasn’t been a democratic decision, those wishing to leave haven’t been victorious. This a victory for oppression. I look forward to reading your comments and to the discussions which follow. Thank you, Rhyley. Even the UK is a young democracy – the equal voting age for men and women, regardless of wealth, has been in place for less than 100 years. We’re still fumbling our way through the dark in to the light. Democracy is a compromise since its supposed to include all of the people. Democracy and freedom is not just about politics and democracy is certainly not “I didn’t get my way, therefore we don’t live in a democracy.” Stop being so selfish. People can go to a gig, people can go to an art exhibition, people are not excluded from going in to shops, read any website book, magazine or newspaper they choose. The United Kingdom is a democracy. People are able to register to vote, stand as a candidate in an election (either for a non-mainstream political party as long as they come up with the cash to stand), informed of when to vote, what to do in order to have that vote counted and people are informed about the policies of political parties. 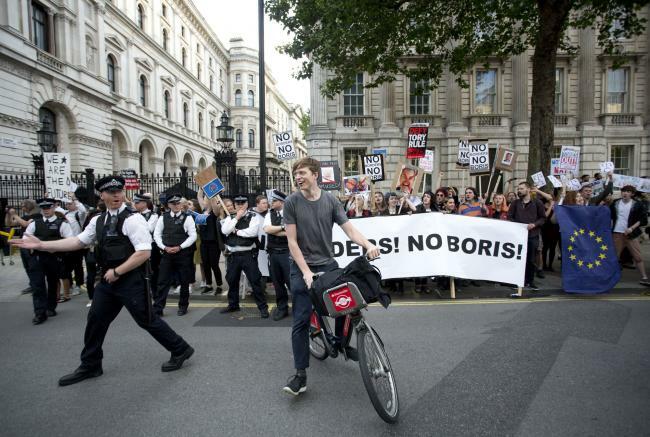 People are able, on a regular basis, to express their political views in various ways: in elections and referendums, through the internet, at speakers corner, in pubs, letters to publications or participate in a protest. We are allowed to freely associate with people. Its illegal to discriminate and incite hatred and violence towards anyone. How is violence a democratic ideal? The only people who are excluded from the political process in the UK are people in prison or non-UK residents. I’m excluded from the French political system, as I am not a resident in France. There are problems with First-Past-The-Post. However, we did have a referendum in 2011 about whether we, the electorate, wanted a different system. There is one person, one vote. In the past people who went to University got a residential vote and a University vote. Using the 20% figure that the Conservatives got in 2015, which is inaccurate anyway since its 24%, to say that this government has no legitimacy is a false argument. Labour would have had even less legitimacy since they got less votes, the Liberal Democrats even less votes. A grand Coalition wasn’t on offer, so it was individual parties competing for power. The Scottish Nationalist Party also have a disproportionate amount of seats, given their total proportion of the vote throughout the United Kingdom (its legitimate to say this as the SNP do sit and speak in the UK parliament). UKIP came third in the popular vote, but only have the one seat. Also, the problem with using the total adult population is that a non-vote has to be assumed as a vote not for the Conservatives. How are you being democratic by assuming and imposing meaning on to something which, in practical terms, has no meaning? Someone might not vote for a whole number of reasons and it could be a family emergency, or something like that, rather than a deliberate choice. If you say that a government needs a 100% of the vote to have legitimacy to put its manifesto in to practice, how do we move things forward? You can vote Labour, but agree with individual policies of a different party. The problem with any form of democracy, or voting system, is that an all-or-nothing. Sometimes people vote for a particular party because they believe its the lesser evil, rather than the greater good. What do we have instead of democracy, a technocracy? Theocracy? Oligarchy? Absolute monarchy? Dictatorship? All of these have advantages over democracy, but these alternatives mean no-one gets listened to. No-one will be allowed to deviate from a pre-determined path. No-one will be able to be the best that they can be. The Conservatives might well win the next election, but there aren’t people being marched in to polling booths and told or threatened about which way to vote. There are multiple options about which way to vote in 2015 I remember there being five options on my ballot paper. The obvious questions are: How are you stopped from standing for election? What is stopping you voting differently? How would you educate people? I’m not going to sign the petition to hold a second referendum because I respect the right of people to disagree with me and because I respect other people’s right to be wrong. Its not enough to allow different opinions, but you have to allow different values too. Stop telling and imposing upon people what is and is not right and let them come to their own conclusions. There is no right or wrong decision in life, just different decisions which are made for different reasons. Learn to be tolerant of different views. Hi Jonathan, thanks for your comment! You raise many many many valid points in your comment, however I do believe that a lot of what you’ve said isn’t relevant to that which I’ve said. For starters, with regards to your final sentence, I do literally say that different views should be debated and discussed – yes absolutely of course. I didn’t however say values, which I did also mean, so I can see why you’ve said that. You haven’t addressed what I’ve argued are wrong with the current state of democracy, such as the mainstream media, education system (how people are taught with regards to critical thinking) party funding etc. and so on. I feel, with the greatest amount of respect as you’re clearly a very intelligent individual, that you’re not necessarily arguing against what I’ve written. You clearly possess the intellect and ability of someone whom is able to think critically and analyse, but many people lack this ability – that isn’t to say that some people are ‘stupid’, absolutely not, but I’m sure someone such as yourself can appreciate that the EU referendum had nothing to do with that which both main sides propagated. If you read my other article regarding immigration I’m sure you’ll agree that immigration as an issue (which is a valid concern when considered properly and rationally) isn’t the cause of the problems that people have been ‘conned’ into believing it is. The 20% figure is correct, (as far as I’m aware) if you include those that were eligible to register to vote, but hadn’t registered. The 24% figure is of all those registered and didn’t include those that could have registered, but didn’t – for whatever reason. I believe you’ve approached what I’ve said by comparing it with what we’ve had previously, which isn’t relevant to what I’ve said. I also believe you’ve made certain assumptions about what I would wish to have instead, which I haven’t actually said. Your comment about my supposed selfishness, based on your ‘I didn’t get my way, so we don’t live in a democracy’ line is ridiculous. My argument is against the way in which we have supposedly come to a democratic decision. I don’t consider the result of the referendum a democratic decision because of the reasons I’ve listed – which you haven’t challenged and so for now, I stand by them but am open to change, if you have arguments against them? In terms of what you’ve said about our freedoms with regards to being within a democracy I have no issues with, you’re right. However, those comments aren’t relative to the specific part of a democracy I’ve tried to discuss and which I don’t believe you’ve challenged? I am ill and am on a lot of medication – I’m not saying this for sympathy or as an excuse or anything like that, I’m saying it because it’s hard for me to read your comment and reply due to its length, (which I appreciate the length and consideration of your comment) but I’m informing you in case I miss anything or have misinterpreted anything. Coming from a psychological perspective, ideas on human abilities to be choice/decision making species is by far overstated. We’re influenced to such a great extent by external circumstances, influences, input and information. Plus, our abilities to process this information is different for all of us – some, such as yourself, have certain abilities that many others lack. The mixture of purposefully inadequate education and purposeful misinformation is a problem for being able to consider that which we have as a democracy. (Hopefully that made sense! Sometimes things don’t always come out exactly as I intend, which is why my article is verbose and repetitive to try to ensure I do get out that which I genuinely mean). I suppose the point I’m trying to get at here and with the article is that the part of a democracy when it comes to individuals voting based on being a choice/decision making individual – is that it’s far too easy to engineer and manipulate. The way I look at it is – if one was to suggest that we put something in our water that has a manipulative effect, we would oppose it, yet that is exactly what our mainstream media does. I appreciate that people ‘don’t have to buy the papers’ and that they’re not ‘forced’ to – but to some extent people have been manipulated into doing just that. Also, something which people often assume when I talk about this is that I am advocating for only those with the cognitive abilities and so on that do critically analyse a lot of/a necessary/required amount of information needed to come to a decision, should be able to vote – this isn’t what I mean. I’m saying it’s possible to have an adequate education system and it’s possible to change the media without infringing on ideas of a ‘free press’ – chiefly because what we have now with the media equates to brainwashing and this isn’t something we should have. There have been countless studies into the effects of the impact of certain words, certain language, certain tone and pictures and so on that have such dramatic effects on people. One only has to look at how advertising has evolved – having previously worked in marketing (before I could no longer justify the income I received for the consumerism and repercussions therefrom that I was causing) within marketing and advertising it is all about constant analysis on the best ways to practically manipulate people into purchases. Marketing and advertising aren’t simply about raising awareness to a product or service, it’s about manipulation – and as I’ve said about putting something in our water to have the same effect, people wouldn’t agree with it. When it comes to people’s views – we shouldn’t consider them in such a binary way. Views are most significantly dependent upon external stimuli and the current state of external stimuli (media) is corrupt and insidious. I hope I’ve covered most of your points and I hope my tone is perceived as I mean to intend it – friendly but with disagreement lol. Also, I don’t disagree about what you’ve said about legitimacy of other parties being in government in the last general election, I never said or implied that – at least I don’t think I did! My arguments within the article aren’t about that, I don’t mention this at all, do I? I’m talking about how the concept of a democracy shouldn’t be simply about all eligible ‘having’ a vote, but how people are informed about and make a decision within being able to/having the vote. A democracy, by simple definition is that all eligible within that particular society get to vote – yes, I’m not denying that, I’m questioning the legitimacy of what makes people vote the way they vote – such as the things I’ve listed in the article. I’m questioning the freedom of individuals to come to a decision – people may be free to vote, but it doesn’t mean that they’re free to make choices. Those paragraphs don’t really get my point across properly! If all eligible in society had a vote, but (for example) one political party used subliminal messages – one could still claim, by the simple definition of a democracy that an election result involving subliminal messages was a ‘democratic decision’ – if we apply the simple definition that is, as all eligible still ‘had’ a vote. Would you still consider such a result as ‘democratic’ if it involved subliminal messaging? Also I agree with what you’ve said about assuming a non-vote is ‘against’ the Tories, however it also can’t be taken as a vote ‘for’ the Tories. It can’t be assumed to be ‘for’ any party, but when considering percentages, the non-votes and those whom didn’t register to vote should be included (as a democracy is about all eligible not just those that do vote) and therefore the Tories only received 20% or 24%. I never said that a party needs a 100%, all I was trying to get at was that which I’ve tried to explain in this reply with the subliminal messages example. I understand that I’ve possibly said certain things and without discussing them further this would lead to one making certain assumptions, but I don’t see how you’ve assumed certain things – like the 100% thing or about me being selfish lol. I think we have an opportunity here in the death of the two party system. UKIP: party of xenophobes, misogynists, homophobes and climate-change deniers. Red-Green Unity: an inspiring progressive alliance of the left of Labour, the Greens, Left Unity, the Women’s Equality Party and the various national parties of Scotland, Ireland and maybe Wales. If we could create something radical, resilient with intellectual rigour *and* emotional intelligence, we’d be able to give voice to the multicultural, inclusive 74% of our electorate who didn’t vote to come out. We could build a sustainable, equitable economic base along the lines put forward by Richard Murphy in his book, The Tax Man. It would be outstanding. Doing that which you’ve said however is a different matter entirely, unfortunately. Under current circumstances, reaching the apathetic, misinformed, the oppressed and so on is almost impossible. We can change certain circumstances, but how we do that I’m not sure? I do feel that those of us not a part of the oppression could and should be doing more considering the amount of resources we have available (mainly people, money and technology) and considering the sincerity and validity of our arguments. So many seem to be stuck online or stuck discussing and debating with what appear to ‘others’ (the oppressed) as exclusive and somewhat ‘pompous’ groups. That is just certain perceptions from certain perspectives though, it largely isn’t the truth, but the truth is unfortunately sometimes irrelevant. I believe that instead of people creating new media and new groups, which they then focus all of their energy on, we should all look to be joining what already exists, such as the Labour Party or the People’s Assembly. At the moment, we’re competing against one another for followers and likes and shares, when we need to be more of a collaborative force . At the moment we’re very inward looking, we write and share amongst ourselves in ways that is for ourselves, rather than looking to go beyond and look outwards. Apologies, I’ve gone completely off track from your comment. I probably seem harsh on certain people and on the ‘left’ as a whole, I also probably appear a hypocrite as I myself have written for those on the inside and not the outside. When I say that we should look outwards I don’t mean every single time though, obviously lol. I decided to send my writing to this platform as there seems to have been dozens and dozens of different writers on a variety of topics, written in different and unique ways – I could have started my own blog, but instead I wanted to join an existing one, far too many blogs and media don’t accept submissions, or when they do – they expect them to be written as by an experienced journalist or competent writer, but not everyone in society has such ability, but they should still be heard. The amount of new media out there and the amount of support out there could be used to create a true alternative to the mainstream media, something that can become the mainstream but without having mainstream views and the current mainstream’s agenda. New media could all unite and with the likes of the Morning Star for example, reach out to those whom currently read the Sun or the Daily Mail. The above is possible with the amount of resources that the ‘left’ have available. Apologies, I am still off track. Also, my comment isn’t aimed at yourself, it would appear I’ve had certain things of which I needed to get off my chest and that are spilling out within this reply to your comment lol. I hope that anyone whom may read this doesn’t think me critical of my fellow ‘lefties’. Coming from a psychologist viewpoint, witnessing certain things and being powerless to make any constructive suggestions is certainly my weakness and my problem. I do believe an assessment of what we’ve done and are to do, an in depth look into our behaviour online and in groups offline and online – is desperately needed for us to move forward and become more effective. I fail however to suggest that we need to take a step back and change our ways – without pushing the very people I wish to help into feeling insulted and becoming defensive. Apologies again Manda, I’ve gone off on one and not actually responded to your comment, apologies.